In order to connect a Facebook Page to your Buffer Publish account, we'll need to authenticate through your personal Facebook Profile that has the "Page Admin" or "Page Editor" role on the Page you're looking to connect. Learn more about Facebook Page Roles here. Whilst we authenticate your Facebook Pages through your personal Profile, we won't access your personal information or publish content on your Profile. One thing to note is that it will not be possible to connect a Facebook Page if you are a "Page Admin" through inheritance from a parent page. To find out, visit your Facebook Page and click Settings at the top right, followed by Page Roles on the left hand side. If you see yourself listed under a section labelled "Admin (inherited from parent page)", then unfortunately you will not be able to authorize the connection between the Facebook Page and Buffer Publish. Log in to your personal Facebook Profile that has the required permissions (i.e. Page Admin or Page Editor Role on the Facebook Page you're looking to connect). If you're subscribed to the Free Plan, click Manage Social Accounts at the bottom left hand of your dashboard. From there, click Add a New Social Account and then click Facebook Page. If you're subscribed to the Pro or Business Plan, click Add a Social Account at the top left of your dashboard, and then click Facebook Page. Since you're already logged into your Facebook Profile, you won't need to enter your login credentials. Click Continue. You'll need to authorize Buffer to access your Facebook account. Click OK to confirm. You'll notice here an option to Choose what you allow. This option is required to be shown in this step due to Facebook's guidelines, but modifying any of the permissions here will mean that we are not able to authenticate with your Facebook Page correctly, and posts that you schedule will fail to send. Click on the Facebook Page you'd like to connect and then click Connect These Pages to Buffer. You can connect up to 10 Pages at once. If your Facebook Page is not listed when walking through the steps above, it means that Buffer Publish does not have permission to connect your Page. To fix this, you'll need to remove Buffer from Business Integrations in Facebook and then try connecting your Page again. Please follow the steps below. When you're connecting your Instagram account, you'll see a step to authorize Buffer to access your Facebook account, as shown here. At this stage, it's crucial that you click OK, and not Choose what you allow. This option is required to be shown in this step due to Facebook's guidelines, but modifying any of the permissions here will mean that we are not able to authenticate with your Facebook Page correctly. 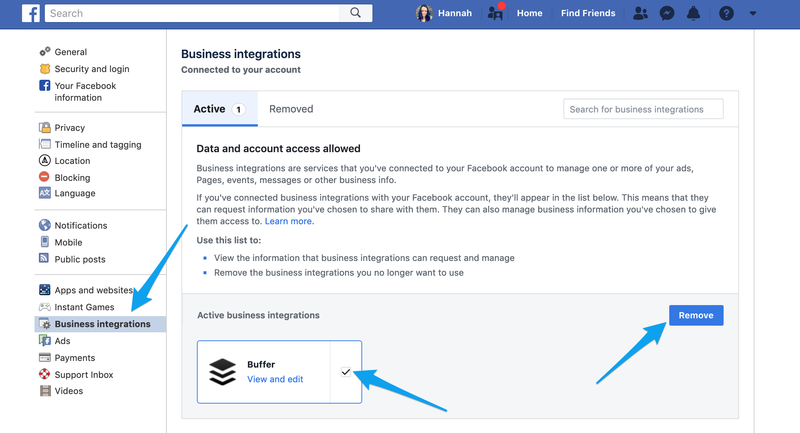 By removing Buffer from Business integrations here, you'll be able to reauthorize Buffer to use your Facebook account and ensure you're not modifying the permissions this time. Finally, head back over to Buffer Publish and try connecting your Facebook Page again, following the steps here.